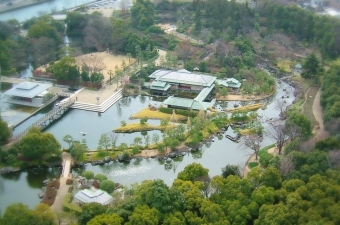 The Shirotori Garden is a Japanese-style garden with a path running along the banks of streams and ponds. The area of the garden is approximately 3.7 hectares. The mound at the southwestern corner of the garden represents Mt.Ontake and the stream originating from the mound, the Kiso River. 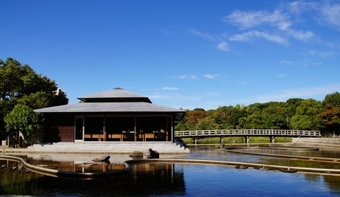 In the center of the garden lies the Seiu-tei, a complex of tea ceremony rooms. Seiu-tei was designed after the image of a swan, or “shirotori”, flying down to rest its wings. 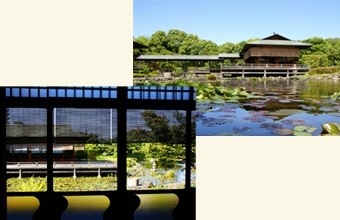 Seiu-tei was designed after the image of Seiu-tei depicts the flow of the tides, one of Seiu-tei depicts the flow of the tides, one of the traditional aspects of Japanese gardens. The ebb and flow effect is achieved by the use of modern technology. Located almost smack in the middle of Shirotori Garden, this is in the genuine Sukiya style, the traditional architecture of the tea ceremony cottage. It stands on the edge of the water. In building it, Sukiya carpenters from Kyoto used nature’s materials to the best advantage. The exterior form represents a white swan winging down to the water. The garden and the building create a beautiful harmony. The mound at the southwestern corner of the garden represents Mt.Ontake and the stream that originates there represents the Kiso Ricer. The whole landscape depicts the flow of the Kiso Eiver from the east of Mt.Ontake on to the Nezame-no-toko ravine. Shioiri-no-niwa is designed to enjoy the change in scenery caused by the ebb and flow of the tides. The water here expresses three moods. One is the change in scenery according to ebb and flow. Another is “fountain water” which depicts the sprays of pounding waves. The third is the mood of the tide receding between rocks. Every Monday(The day following weekday if the Monday is a holiday. ), and dec.29-Jan.3. Copyright© Iwama Garden Create Co,Ltd. All Rights Reserved.